We save lives and create more birthdays by helping you stay well, helping you get well, by finding cures, and by fighting back. One person can make a difference. Your involvement with the American Cancer Society Relay For Life is essential to supporting our mission to defeat cancer once and for all. The monetary support you provide is invested wisely. 75% of funds raised in CA was spent on national and California based research, prevention, early detection, treatment, and patient support services. Learn more about how your donation helps save lives in California. Read more about how your Relay For Life involvement is making an impact in the fight against cancer. Get Well- Patient Services: If you are diagnosed with cancer, where can you turn for help? The American Cancer Society offers many free programs for patients and survivors, including rides to and from treatment; the Cancer Survivors Network for support; beauty products for patients to help them restore their self-confidence after debilitating treatment; and more. Learn more about prevention and detection programs. Find cancer information. Find Cures- Funding Research: The American Cancer Society is the largest source of private, nonprofit cancer research funds in the United States, second only to the federal government. The Society has had a hand in virtually every major cancer breakthrough of the past half-century. With your help, we can continue on this path. At select Relay For Life events, you can personally participate in research that could help identify factors that cause or prevent cancer . 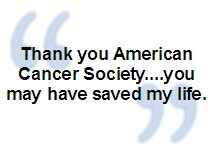 Learn more about the American Cancer Society’s Cancer Prevention Study-3. Fight Back- Advocacy: The American Cancer Society Action Network (ACS CAN) is the Society's nonprofit, nonpartisan sister organization that consists of a grassroots network of volunteers working on the local, state, and federal levels to pass meaningful legislation. ACS CAN advocates for stronger public health laws to fight cancer and achieve equal access to quality health care for all people. The monetary support you provide is invested wisely. Learn more about how your donation helps save lives in California. We'll fight with faith and fight with strength until our spirits soar. And one day soon we'll see the end, we pray it won't be long. Never give up, never surrender, Celebrate, Remember Fight Back!